This recipe is a bit different from those I usually post. It actually came from a National Geographic Kids magazine that we received back in March (not sure if this year or last year… ). 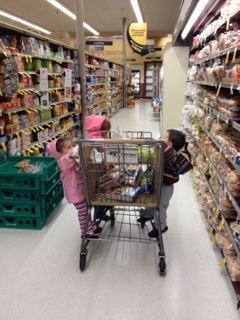 Anyway, it sounded like a really healthy treat for the kids and it was fun to do with them. The kids loved putting the stuff into the blender and there were enough ingredients for the four of them to “take the lead” in something. Best part about it was that IT IS EXCELLENT!!!!!!!!! We couldn’t get enough. It was so good that the next day I had to go shopping again for a refill of the ingredients. Try it! Put all the frozen ingredients in the blender. Then put the rest on top. I am long overdue for a post – I will explain shortly. For now, I wanted to share this smoothie recipe I sent out this time last year. 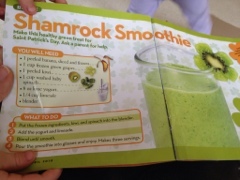 Good for your kids (actually it is downright delicious) and fun for St. Patrick’s Day. Enjoy!